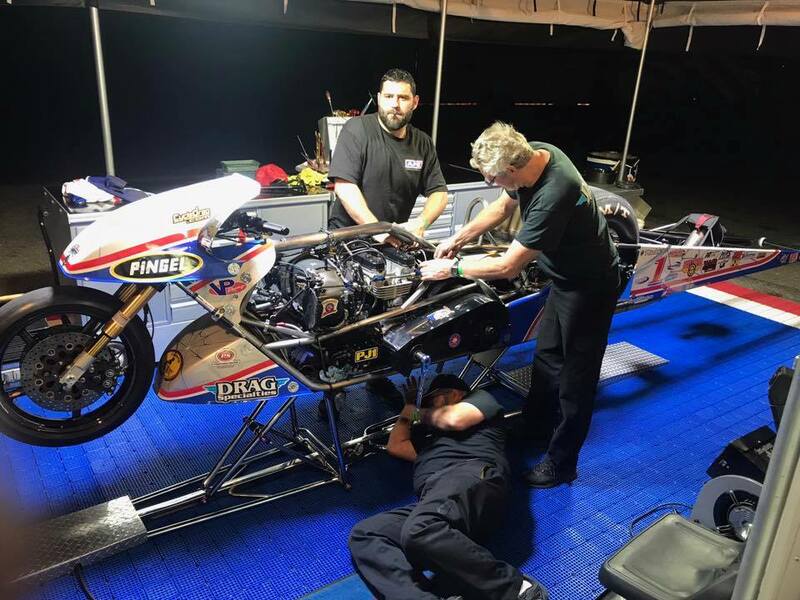 There is a new speed king in motorcycle drag racing. 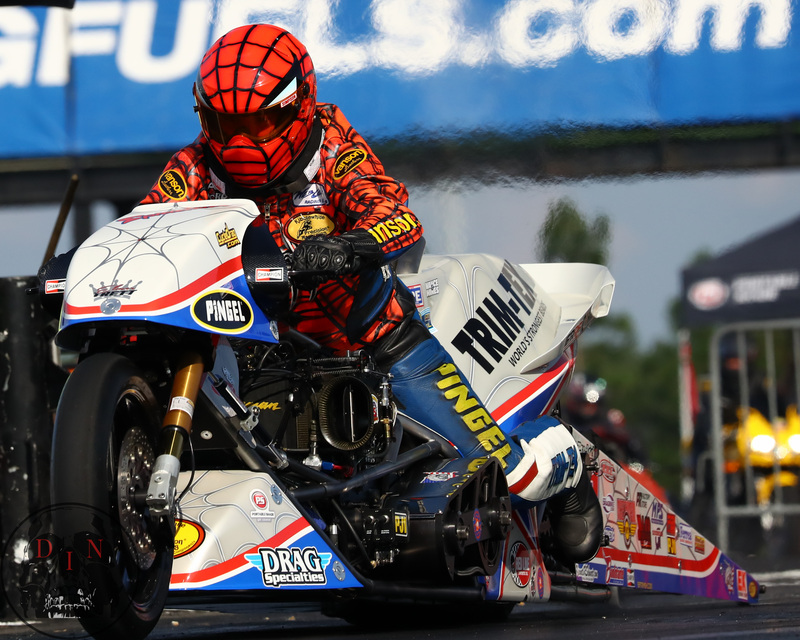 Top Fuel Motorcycle legend Larry “Spiderman” McBride knew his Trim-Tex-backed team needed to be on its game heading into Rockingham Dragway, Sept. 23-24, to defend a slim five-point lead over veteran Sam Wills in the ManCup Series. The 16-time champion rose to the occasion and experienced one of the most unusual, exciting and successful race days of his four-decade-long career, highlighted by a new record speed of 255 mph. The weekend was not without its share of adversity for the Spiderman. On Saturday it was Wills who scored first with a 5.90 run in qualifying to secure the pole position. McBride’s 6.11 landed him second in the six-bike field. His crew worked late into the night to make changes for Sunday. The crew of Larry McBride – Steve McBride, Chuck Stuart and Roland Stuart working hard to make changes for race day. On Sunday McBride lined up with longtime friend and rival Chris Hand. 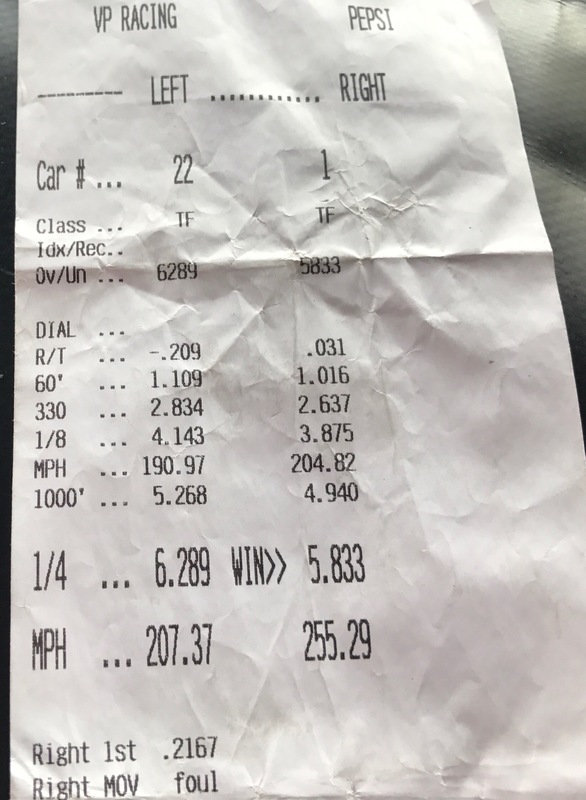 McBride and Hand produced the ManCup’s first ever side-by-side five second pass, only the third in the history of the sport, with Hand running a 5.88 to McBride’s 5.95. However McBride was able to reach the finish line first by virtue of his .115 to .188 reaction time advantage. McBride can’t remember the last time he has won on a holeshot. In the second round McBride gained a win over Dave Vantine, who fouled out with a -.209 red light. McBride recorded a 5.83 with the milestone speed mark of 255 mph. McBride’s previous career best speed was 248 mph. The veteran racer always strived to eclipse 250 mph, but the task proved to be elusive. McBride was stunned he picked up seven mph from his previous best. McBride could not reveal too much about the new combination. Larry McBride runs 255 mph! The victory set the stage for an epic final round between championship contenders Wills and McBride. 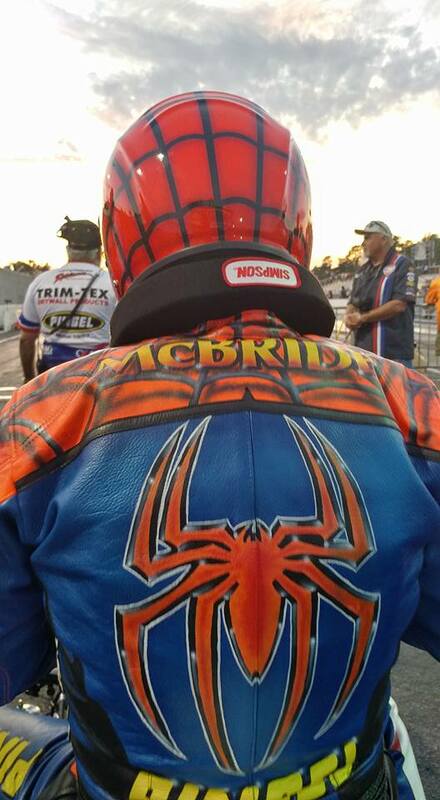 The Spiderman got out in front and was able to hold the lead with a 5.82 at 246 mph to Wills’ 6.23 at 230 mph. 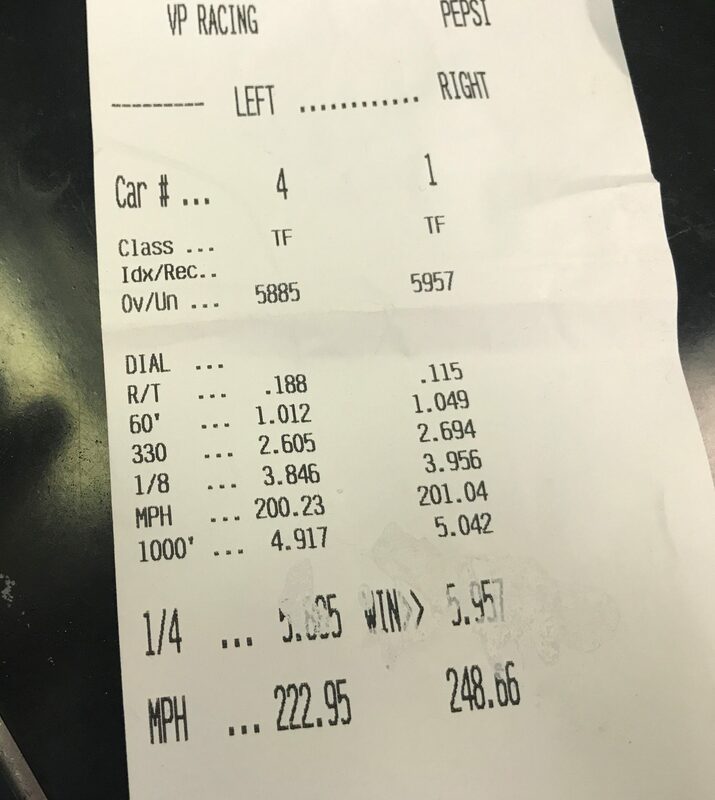 McBride was again first off the line, this time with a .083 light. The veteran racer shut the bike off just before the finish line. The Spiderman was ecstatic, that not only did he get the win and a new record, he escaped Rockingham with very little damage to any of his engines. The championship-deciding race for the ManCup will take place Nov. 17-19 at South Georgia Motorsports Park in Valdosta, Ga.
Next up for McBride is the IDBL DME Fall Nationals, Oct. 6-8 at Maryland International Raceway where McBride is aiming to become the first dragbike racer to enter the 5.60-zone. 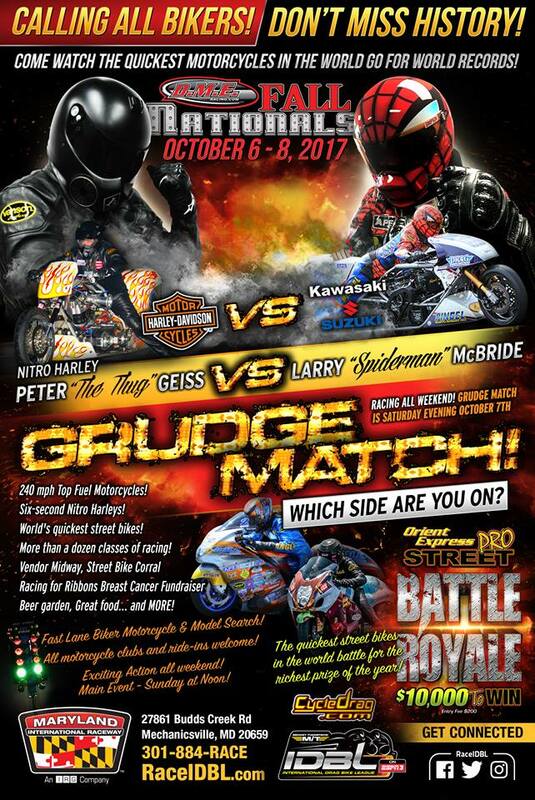 The Spiderman will also face a weekend match race series from Vantine and a grudge race on Saturday Oct. 7th against Nitro Harley standout Peter Geiss.